Ask any animal lover or ecologist, and a visit to the remote and idyllic Galapagos Islands will undoubtedly feature high on their bucket list. Located in the Pacific Ocean, more than 1,000 km from South America, lie the 19 islands that make up the Galapagos Archipelago. The ocean around these islands is protected as a marine reserve and has been called a ‘living museum of evolution’, with the extreme isolation of the islands and unique environmental conditions allowing the plant and animal life here to develop without interruption by human intervention. It is for this reason that the immaculate islands inspired Charles Darwin’s theory of evolution by natural selection when he visited in 1835. Groups such as the Charles Darwin Foundation are active on the Galapagos Islands to ensure their unique environmental balance remains intact, and that the natural capital of the Galapagos is conserved. 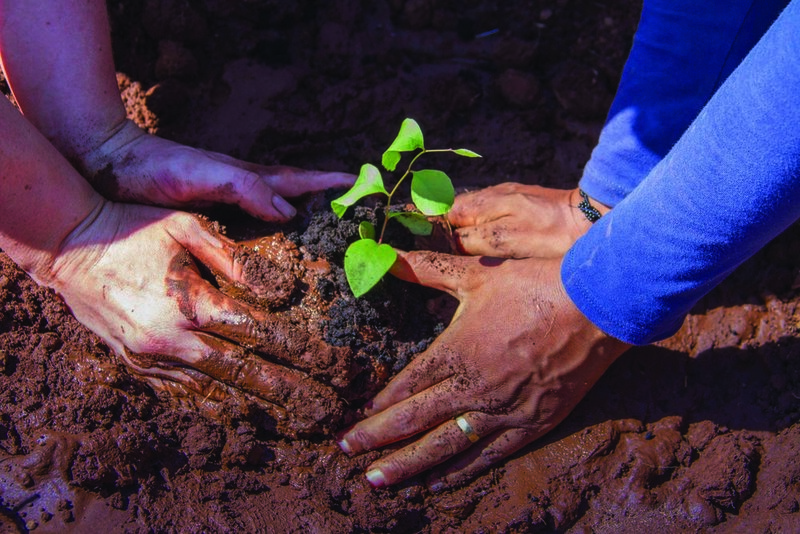 We joined up with them on Baltra Island and, with the help of volunteers from the Ecuadorian Air Force, planted the first 200 native seedlings, with many more to come as part of the Galapagos Verde 2050 (Green Galapagos 2050) project. The conditions during the days we planted were challenging and put us all to the test. Scorching hot temperatures reminded us we were right on the Earth’s equator line and without machinery available, we were manually digging holes in rock hard soil. The first results have shown that water retention has been somewhat lower in this area, the long term effects of which are still unclear. We are working with the Charles Darwin Foundation to investigate the root cause and find solutions to get planting results to the same high levels as in other areas around the world. The overall goal of the Galapagos Verde 2050 project is the restoration of degraded ecosystems and sustainable agricultural production. It aims to restore large parts of the islands’ arid and highland areas with endemic plants by working with national and international partners, like Land Life Company, to provide technical and scientific expertise.